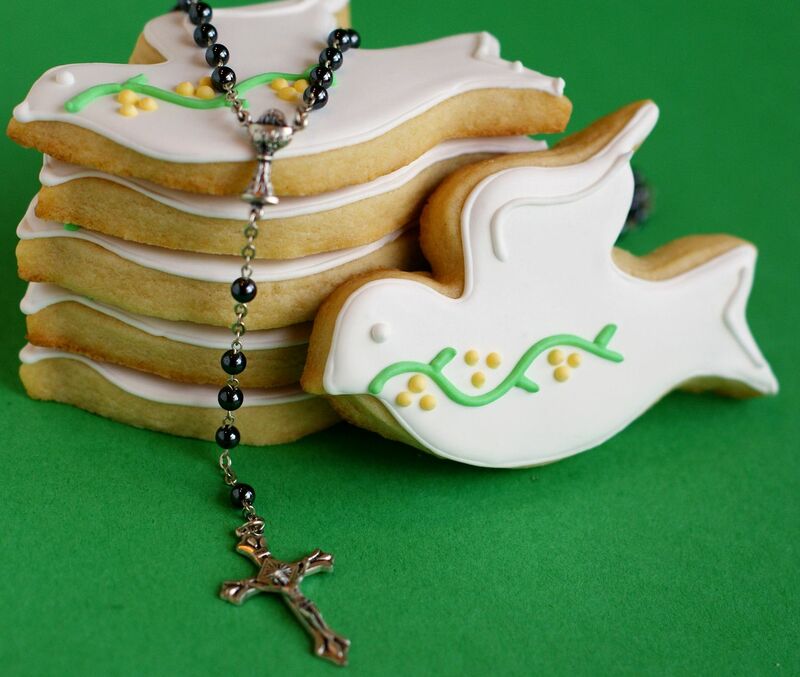 Confirmation Cookies . . . 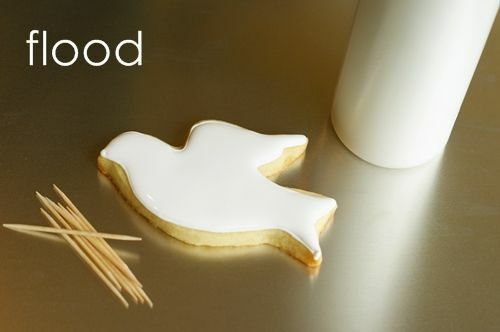 There is something so sweet about a dove cookie. Maybe it's the occasions they represent? I've made them before for a baptism. A friend's son is getting confirmed this week and these are for his confirmation class. I really love the way the personalized ones came out. I think everyone likes to see their name on a cookie, don't you? Wanna make 'em for a special occasion of your own? 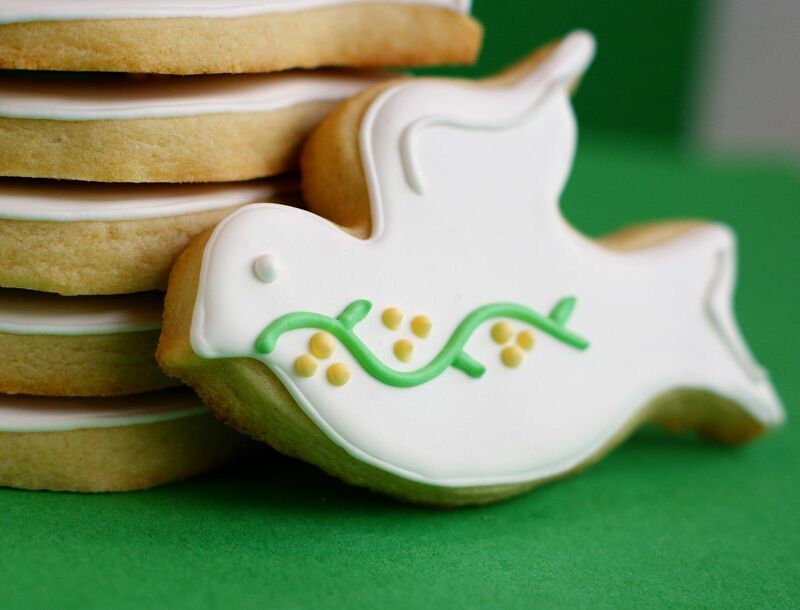 oh, and dove cookies! The cutter is from Sur La Table. 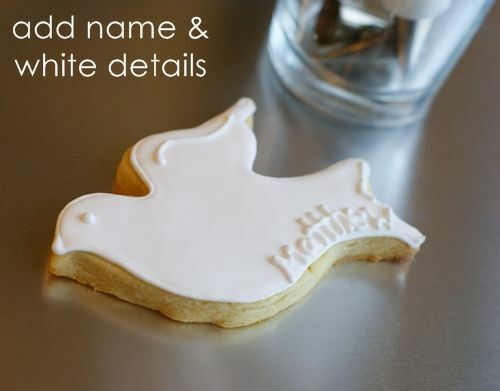 With the reserved white icing and #1 tip, add detail on wings, tail and add an eye. Personalize, if you want. Using another #2 tip, pipe the branch in leaf green. With a #1 or 2 tip, pipe yellow flowers on the branches. 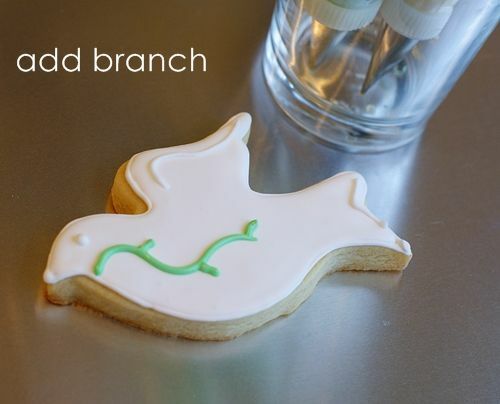 I have not once made a pretty dove cookie. I am in LOVE!1 WONDERFUL interpretation! Those are beautiful. I've recently found your blog and I am in amazement. I now have "Make cookies like Bake at 350" on my "To Do" list! You make cookie decorating look fun and not scary. ...and now I may make them for my other goddaughter's confirmation this May. 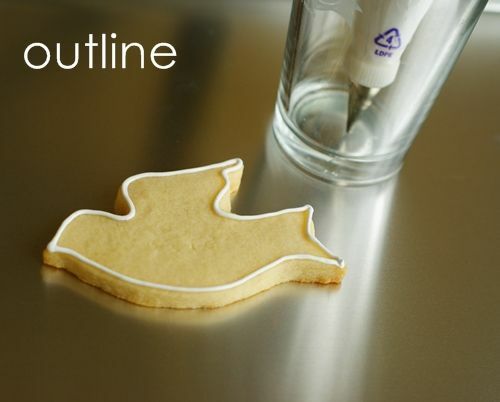 I love your work, these cookies are beautiful. They look beautiful, the names make them super special. these are so lovely! I'm going to make these along with little white dresses for my nieces first holy communion in a few weeks. As usual they are perfect! You are so darn creative. These are gorgeous! 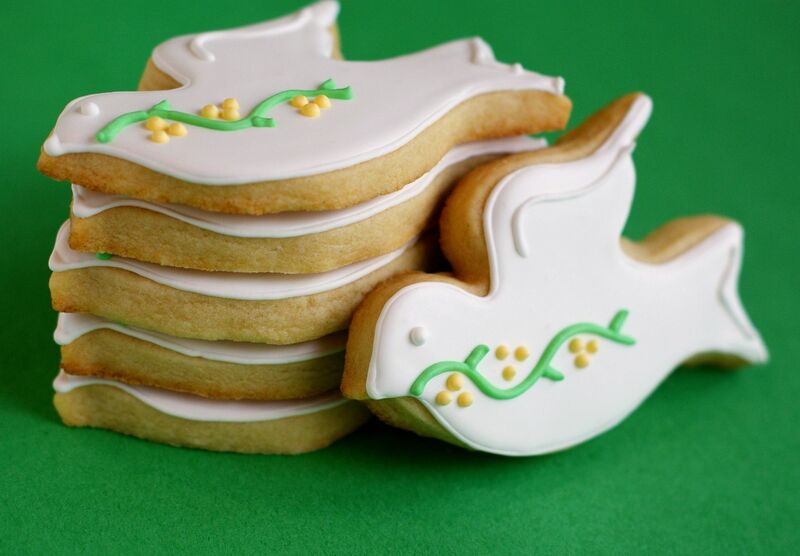 So very lovely... love these cookies, B. Those cookies are so nice! You continue to amaze me! Beautifully done and thanks for the tutorial too! These came out just gorgeous! These are absolutely gorgeous, Bridget! These are beautiful Bridget!!! I love the design and where you wrote the name! Bridget, these are just beautiful. I love the white writing on the white cookie and the green/yellow accents. Gorgeous. Pretty. Love the addition of the names on them. These are just beautiful, Bridget! I especially love the way you piped the names in white. The dove is so lovely and so perfect for the occaision. Thank you. Have a beautiful day. Very very sweet and special. I love that you included a rosary in the last photo. 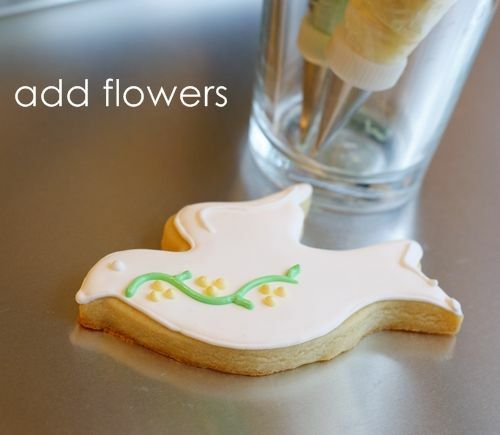 So pretty and delicate, you're right everyone is going to like seeing their names on the cookies. These are so simple and pretty. And YES - everyone would love to se their name on a cookie! They are lying if they say differently. These are beautiful! I would have a hard time eating them - they are too pretty! Oh gosh those are too lovely! So lovely as usual Bridget! Perfect for the occasion! These are really lovely. Simple and full of peace and promise. 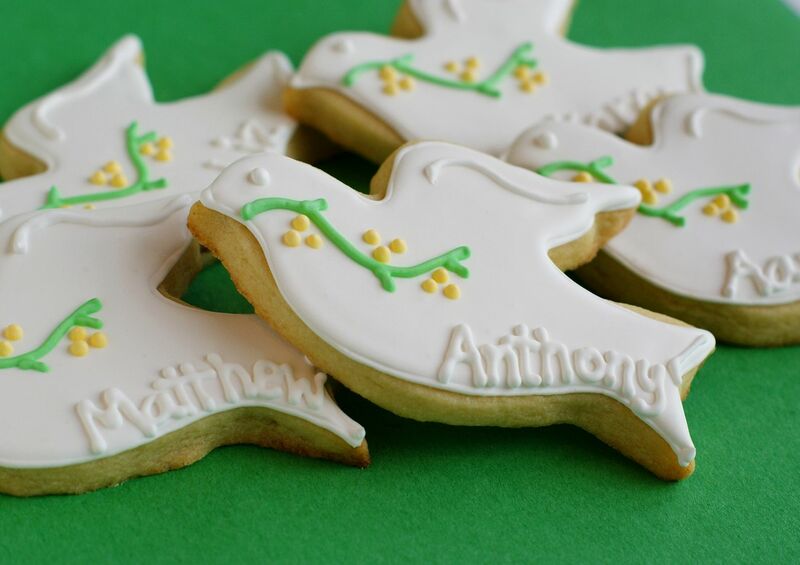 These are perfect for a confirmation, and yes, I do think everyone feels a bit special when their name is on a cookie.